Here is some great news for all of you iOS gamers out there, more specifically, the ones into racing games or great graphics. Firemonkeys has revealed that Real Racing 3 is coming out later this year and also released the first trailer, which looks incredible. Last month, EA announced that it was consolidating its two biggest mobile studios based in Melbourne, Australia. Those two were Firemint and Iron Monkey studios, and this will be the first iOS game to be released out of the new mobile development studio. Featuring all-new licensed tracks and a robust lineup of licensed cars from all-new manufacturers, Real Racing 3 is set to deliver a rich, next-gen racing experience with the most beautiful and authentic circuit racing available on mobile devices. REAL CARSGamers will enjoy graphics that have been meticulously hand crafted to produce photorealistic visuals as they zoom around in cars from manufacturers like Porsche, Dodge and Audi. 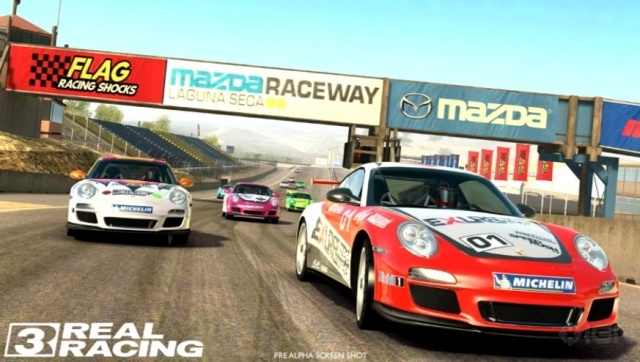 REAL TRACKSFor the first time in the series, Real Racing 3 will also include a full lineup of real world tracks from the top names around the world including Mazda Raceway Laguna Seca, Indianapolis Motor Speedway and Silverstone. With a 22 car grid, gamers will be able to pit themselves against 21 other drivers in one race. REAL RACING EXPERIENCEFans can experience the glory of championship racing on real tracks recreating the full race-day pressure and environment in a game that harnesses the full power of mobile hardware to produce a beautiful racing environment. We can’t wait to play this on our iDevice, more specifically, our iPad 3.